http://Www.twitter.com/tbtimesforumHey guys, Kat here to share with you some exciting Olympic sized fun on what’s happening tomorrow here in Tampa Bay! Tomorrow, Tuesday October 24th it&apos;s time to get "social"! Two Olympic Gold Medalists will be making special appearances and participate in a social media “scavenger hunt” to promote the 2012 Kellogg’s Tour of Gymnastics Champions happening right here in Tampa Bay at the Tampa Bay Times Forum on Wednesday, October 28th. McKayla Maroney, 2012 Olympic Gold & Silver Medalist and Jonathan Horton, 2008 Olympic Silver Medalist will be making stops by five different Tampa Bay landmarks and taking photos. Each picture will be sent out on social media outlets from @sportstampabay , @visittampabay , @tbtimesforum and other local social media outlets. The first person to stop by each of the landmarks following the distribution of the picture will win a family 4-pack of tickets! Follow @visittampabay and @sportstampabay and @tbtimesforum on twitter and stay tuned tomorrow morning for the first chance to win tickets which will be around 9:30 a.m. 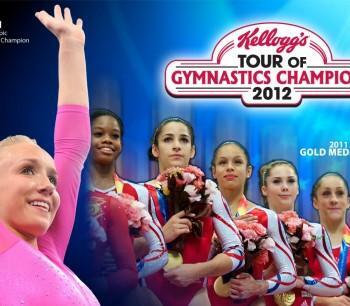 The Kellogg’s® Tour of Gymnastics Champions is unlike any gymnastics tour ever produced, providing fans with a high-flying, dynamic experience that will celebrate the sports&apos; beauty and skill. Bigger and better than ever, the show&apos;s format will pair elite gymnastics skill with modern performance art that will push the boundaries of athleticism and keep fans cheering for more. 2008 Olympic all-around champion Nastia Liukin will lead an impressive cast, including members of the men&apos;s and women&apos;s 2012 Olympic teams. And with performances by local gymnasts in each market, the Kellogg&apos;s Tour will highlight and celebrate the sport at every level. Ticket prices for the October 28 Tampa Bay Times Forum show are $25.00, $35.00, $48.00, $75.00, $125.00 and $200.00 (service charges are not included) and may be purchased at the McDonald’s® Ticket Office at the Tampa Bay Times Forum and Ticketmaster.com. To order tickets by phone, call 800-745-3000. In recognition of Visa&apos;s long-time support of USA Gymnastics, Visa is the preferred method of payment. Stay tuned for more fun things to do in the “social scene” this week in Tampa Bay!